Species description: The Nimravid saber-tooth cat (one of smaller ones)with razor –sharp sabers and after Dinictis and Hoplophoneus on geological chart which is believed to evolve from one line of hoplophoneus saber cat that roamed North America beginning in the Oligocene Period for only a few million years from 30-27.7 MYA . These animals had a lot of physical characteristics similar to Hoplophoneus Sicarius except for size , as Eusmilus was the genus for that animal until a short time ago . All these are small saber cats only 5-6 inches long with large sabers and flanges for the size which makes it look like a barbourfelis and a hoplo except for much smaller size .It had only 26 teeth compared to 44 for most saber cats and it was lacking molar 1 talonoid and premolar 2 on the bottom jaw . It was bobcat sized with lynx sized head and was built like Barbourfelis for size (Of course Barbourfelis is much larger ). Long bodied and short legged compared to others, and they ate grazing ungulates including camels and oreodonts. They could open their jaws at a 90% angle . Most of the info on internet is incorrect as below is correct . It did not live 8 million years, just over 2 and did not have a large species in America (only this small one)at least and one in Europe was bigger . Species description: These hyenas were known as the Ice Age Spotted Hyena and was a subspecies the second largest Hyenas of all time and was a carnivore who stalked and killed animals in packs it was about 6 ft long and looked similar to a modern hyena except much bigger including the head was much wider and different shaped possessing a long body and short legs. This species once ranged from Iberian Peninsula to Russia .This hyena was a highly specialized animal. These weighed over 250 lbs .They ate wild horses , steppe bison, and wooly rhinoceros that was so ruthless it could kill almost anything with its progressive and regressive features being more developed than the modern African species. Its extinction was earlier than other Ice age mammals with last one dated 11,000 years ago with most gone 14,000 years ago. This helps explain the only few specimens like this one in Middle Asia . Its extinction was due to climate change, and an inability to compete with lions and humans, and loss of grasslands which they hunted. These though did likely kill wolves which roamed with them due to being more powerful. Item rating and description: 1-10 10 Perfection on an extremely rare animal Cave Hyena 13.5 “ long with Super Teeth and Totally Original 100 Skull . I checked with all European dealers and only 2 ever sold a skull, and those 2were only 80%. No other dealer has even seen one. Pieces and parts but no full skulls. And what a skull. It was never broken not even zygotes. This is the Rarest find in Europe and probably the best ever found from searching all literature in history . This was cleaned off only no sealant no nothing. I have never even seen a complete skull as people in Europe and Asia have never seen . Not one bit of work was done to this as it was sitting in a cave protected from thousands of years / These caves were only recently discovered so not even Europe knows about these. So few people in the world know of these they don’t even know how to price –that’s how rare they are . All animals in this area are dark and this was lightest of all animals found but still darker reddish brown. Most animals are black from here only . The ones in Europe are light. This could be the areas of first ones due to color 500,000 years old . Darker the color the older they are. Next to Bonecrusher hyena this was one of 5 top carnivores at its time including sabercats, lions, bonecrusher hyena and this. This is perfection to top degree. IT attracted huge animals like wooly rhinos, horses, wooly mammoth etc. Its huge 13.5 inches and 9 inches wide so no compression. It comes on a sturdy stand also . Where can you get a top predator this good. It’s amazing .This specimen displays so well with total originality This is worth a fortune. People in Europe are different from USA –they like totally natural 100% but will take partial animals more than prepped animals but this is so good it can be owned by anyone who wants to premium bone . While nothing is perfect this will sell so fast to Europeans or Americans as it perfect. One tooth repaired. That’s it. 100 % original and so rare you will never ever see another. I’ll be getting more animals from this region including lions so be ready or these will go so fast it will make your head spin .These go for way more than I want especially from an area that never found them If no one buys this that’s fine it will stay with me as find another. It’s for someone collection who has most everything but they don’t have this. Even poor ones in Europe go for more than I’m asking Call on this one. Keep in mind only 2 dealer has even seen one in Europe and Asia until now .Only accept wires or Cashiers Check . Mounted I on beautiful display . You can find an upper or something that has lots of resto but not one like this This is for a perfectionist and probably the best skull of this rare species in the world . This is a premium skull not like a few that are missing many parts so you cant compare this to any other . 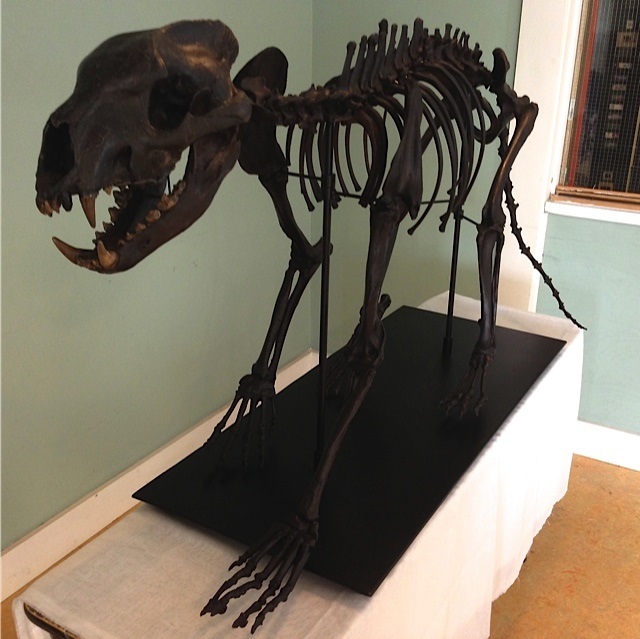 Species description: The LARGEST Smilodon genus sabercat from South America with 12” canines . These animals looked like smildon fatalis but much bigger .It was 9 “ long and massive with height at least 4.5 FT . It was the largest of all machairdontants .These cats weigh 1000 lbs at least . Species Description :This cat evolved from Machairodus and appeared at Miocene –Pliocene border about 5 MYA and lived in Africa as well as Euroasia and died out lastly in Asia and North America about 10,000 years ago so it was highly successful . 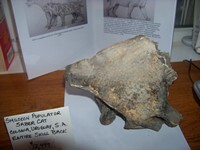 It was a scimitar cat built built like a modern lion that had about 13 “ skull but much longer teeth called sabers . It was larger than average saber-tooth cat that was very successful yet hardly ever found in fossil records .Complete Skeletons have only been found in Texas . It looks like megantereon, however much shorter sabers and less sized lowersaberguard and sabers reached to end of lower jaw as this one does. It reached 1.1 meters at shoulder . As said as compared to megantereon,and gripping force . 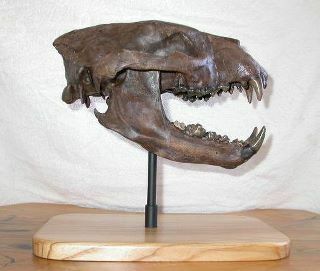 The skull was longer than smilodon, and machairodus its sabers were relatively short. It provided a great punchuring and gripping force. This jaw has turned down flanges to protect the scimitars. It has large canine teeth that were crenulated and designed for slashing rather than purely stabbing .. Some of the physical appearances were unusual for a big cat as it had limbs that were hyena –like . Forelegs elongated while hind legs were rather squat with feet plantograde causing back to slope down towards a short tail similar to a lion. It had a large nasal cavity opening like a cheetah which allowed greater oxygen intake with brain visual cortex large and allowed it to hunt during the day instead of night like many cats . IT lived 5 million years longer than megantereon . It hunted in packs and not only killed mammoths but also rhinoceros juveniles . 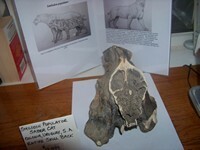 Item description: and rating : 1-10 10 X-Ultra Rare Beautiful Complete Adult Female Homotherium Scimitar Sabercat Skull 13 “ long . I’m selling for a friend so its not here .It is 98% original bones and 100% Org Teeth with one incisor absent but naturally missing as it probably broke off in a kill or fight (per noted authority who wrote a book on scimitar cats ). The socket was filled with natural bone, and the lower matching tooth as less worn indicating the cat lost it long before it had a chance to wear down the opposing incisor so the pathology tells a story while this sabercat was alive . I have wanted a whole one for years and the opportunity was afforded from from a friend who is a top expert on these creatures , and this will be admired by me and ones who read this and never sold . Another owns this now and I’m selling for them . IT was originally from a German dealer a year ago . Most were about 13-14 inches long so this is an adult . This has shoter and wider sabers than a megantereon, as they go well past the saber guard in size. This is one of most complete skulls you would ever find with lowers . Only a number of them have been found in a Texas cave and 2 in Florida and a handful in China and Europe . The great thing about this species it is a form of crenatidens but a different unclassified species that needs researched even more so we can safely say only a few exist . I have never seen another for sale anywhere in 20 years . AS someone who knows a lot on cats said the species is close to Xenosmulus but different so no species has been classified to date , . Anyway its so rare has been classified under crenatidans for now . Wow what a sabercat Its not mine and not here but Ill get you in touch with that person . Species description: Horses evolved from earlier horses to be large and this horse evolved into one of the modern species so this is extinct at end of last ice age . They were long –legged compared to earlier horses and long necked with a long tail. They are adapted to open terrain, from plains to savannahs. These had slender legs ending in a single hoof. These were herbivores that lived from grazing on tough fibrous food such as leaves, bark, but are normally grazers .They went extinct at the end of last ice age 10,000 years ago .It is from USA . Item rating and description: 1-10 9 - Beautiful teeth from an extinct horse tooth . The beauty and quality of this animal is simply fantastic. 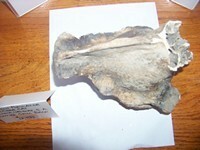 Great extinct Pleistocene specimen at a low price. Beautiful dark brown Color is so appealing for you collectors. Species description: The Walrus is a large flippered marine mammal that lived and do live in Artic temperatures. It is the sole surviving member of the Odobenidae. It’s noted for its prominent tusks, whiskers, and bulkiness. It was a contemporary with the wooly mammoth, and can weigh up to 4500 lbs which is amazing. It was able to survive the extinction event due to finding ice areas away from prehistoric peoples. The males and female have tusks, with males usually bigger. Pacific species are larger by about 20% as is this. For non- fossil people who may wonder if legal- it is. The law states that Post 1972 any a walrus ivory that has been carved or scrimshawed by an Alaskan-(which this was sold by an native Eskimo in Sitka, Alaska and sold to me )are legal to buy, possess and sell. Raw ivory which not scrimshawed is not legal and does not apply here. This was inspected by customs in Alaska also. This is was formulated by USF&W so this is not raw ivory in any way. Raw not scrimshawed is only legal to sell except between 2 eskimos but it is legal to own. This means you can own raw ivory also just not buy or sell it . Again this is not raw ivory It has writing all over it on tusks . No tags or documentation is needed or required on totally legal fossils on any type fossils including this . This is sold with tusks out and you can put back in on delivery which I would help. No refunds of any type will be provided on this item ever as it is what it says it is ,100% original except for pictures put on later to make it legal .. So the initial eskimo has the license but once he sells to another Alaskan who does scrimshaw it is legal for anyone on future sales or owning This means if you wish to sell someday you can do so or keep it . 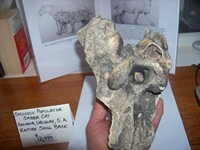 This is well known by all dealers and collectors as much is sold at mineral fossil shows and online . Item description and rating : 1-10 9.6 Gorgeous Beauty of The Past World -Mammal Didelphodon Vorax Tooth . This was ides also by the founder of a new species of Didelphodon. It is fairly rare also It shows the little mammals who where during the dinosaurs. It is a great tooth for a great price. Its very inexpensive / Open display box provided. Description : It was closely related to Gray wolf in many features but it is not direct ancestor of any species today . IT became extinct 10,000 years ago with wooly mammoth . IT was larger than Gray Wolf averaging 5 ft in length and weighing 150-175 lbs . 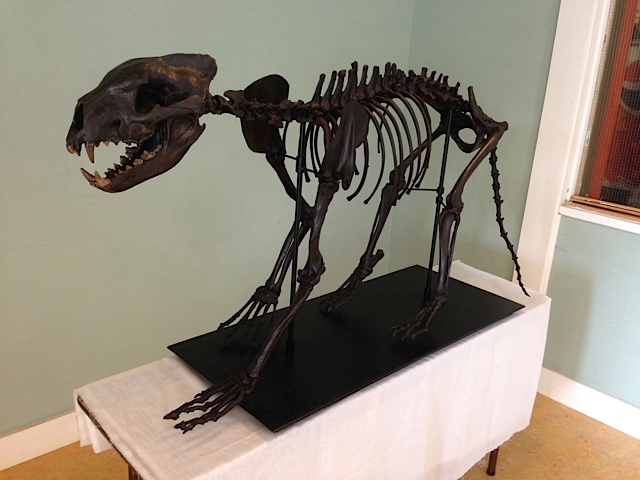 Legs of Dire Wolf was shorter and sturdier than those of gray wolf and the brain case was smaller to than the gray wolf .These were mainly found in California and Florida. 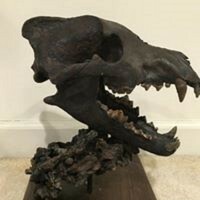 USA Description : SPECTACULAR AMAZING LA BREA TAR PITS HIGHLY ORIGINAL DIRE WOLF 12.5” Skull with Tar with an assemblage of Dire Wolf Bones . I would say this is one of a kind but I have two of them . 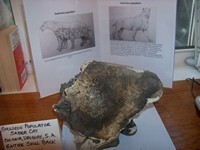 I haven’t seen a La Brea Dire Wolf in 10 years and never saw one this good except the other one I have for sale. This is so wonderful I can’t find the words to express my amazement at the quality of this specimen, so it goes into my personal collection. It is highly original and would estimate 90% with all teeth real teeth, and a few from other Dire Wolf La Brea parts. The skull is amazing. It has only restore at thin section at middle of the skull , and part of back above the condyle area., little on back of lower jaws , and that’s it . The condyles are real. The teeth are amazing and 90% from this animal including incisors except 3 upper. Words just can’t describe this piece. It was so difficult to prep because normal air compression work would have caused caused the color to change as it was so fragile and the most difficult prep job a top prepper ever did . It was stained a lot .It took one year to complete . The assemblage of bones is original with toe bones, verts and others full and partial in the matrix which was a part of the unprepped animal . It is just spectacular . Even the zygos are original on this animal. It has repair but teeth were full, and little need repair on these. They are wonderful . Imagine even real incisors in the front. THis was of course from an old collection and was laying around for probably over 50 years before the government took over ownership . I’m so pleased to own this and regard it as in a league of its own. LaBrea just isn’t available anymore , and if anyone does have one they don’t sell it . Notice the patented dark brown color. This is the original color in an area of high concentration of oil as some are lighter. Well I can’t say more on this as words are not adequate to do this justice so maybe the pictures will. Im selling for a friend who bought this from me a few years ago . ILl take care of the details of this specimen. Species Description: Unknown MORE THAN RARE (NON-EXISTENT except this one) Extinct Species of Bear- Dog of Miocene existing for a few million years from 23-19 MILLION years ago . It was assigned to amphicyonids. While initially related to bears it is now found they may be basal caniforms . This is one of the most unusual carnivore . 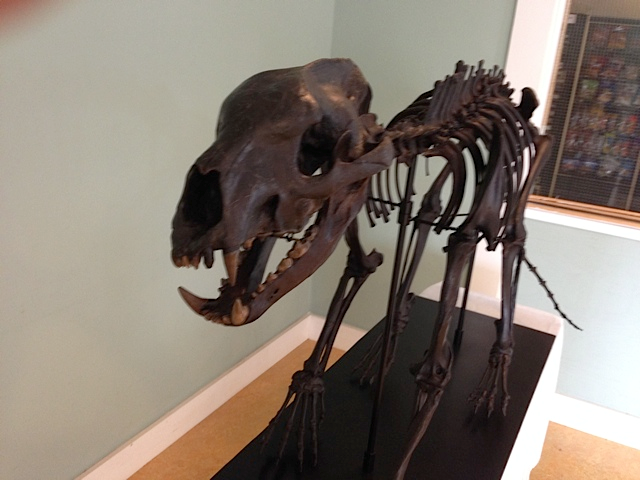 They were as tall as a black bear , and moved here from Eurasia in early Miocene . It weighed 150 kg and combines features of canine and feline predators . It resembled a giant dog with a flexible cat-like body . These bear-dogs with long limbs and specialized in chasing down prey on the open plains. Only two partial mandibles have been found in Nebraska , and a part of a lower jaw in Florida . This is of great scientific importance to everyone, and unlimited value . It was described in 2008 only so very recent partial finds. Family :Daphoendon Genus :Borocyon Unnamed Unknown Species of BEAR DOG Highly Original. No one on earth has anything of this animal and I have the skeleton with skull. Its been in my collection over 15 years. Over 85% of skull is original bone and a beautiful highly original skeleton with only a few smaller upper foot bones are restored on one foot and one fibula. It doesn’t get much better than this -a mounted beautiful skeleton of an I unknown beardog. This is of great scientific value also besides the great beauty it shows. The head and all the inner bones(femurs, tibias, ulnas, humeruses, fibulas, radiuses, metatarsal and metacarpals ) except the shoulder blades are all from one beardog found on private land. These weren’t even repaired as they were whole. Many of the foot and hand bones were from this animal , with some foot bones from other beardogs. The shoulder blades, ribs, and some verts were from another animal all stained to match color of original beardog. We believe another beardog animal was amongst these bone also due to different colors-maybe female with male. The skull is 14” and amazing and its mounted beautifully for your enjoyment. It comes in sections like each leg, pelvis and tail, head and verts as well as ribs and screwed in into an almost invisible frame that makes it so appealing. This is an amazing find as no one has this anywhere. Again only 3 small foot upper bones are not bone , which is amazing in a large skeleton amount . This is why we think another mate lived with this one and between the 2 provided one mount . It was prepped well to show the creature in a highly original way . This has no papers describing it but we know it’s close to robustus which was only described from only a few pieces of skull -2 in Nebraska.. This is of extreme scientific value and highly original. This has all teeth –some placed in from another animal the same species found with it. Of course this is so rare this should not matter as you can’t get this anywhere .The teeth are fantastic and not even worn. Its far from perfect but it is a great piece mounted so well. Who has even another species of this? No one is the answer. It was gotten from a hunter, and it’s a treasure. It was professionally prepped with bone quality simply outstanding, and color great. You really can’t value THIS ITEM since not one exists. Beyond a museum piece, in my private collection. I’m so proud of this piece .I really can’t say anymore than here because nothing is known of this animal. You won’t find anything under this in google so here is your info. It was found in a cave inland on private ground. Its been in my private collection for many many years . Above is best I know. Species description: The largest of the mammoths here in North America in Alaska and Asia. It had size of up to 15-17 ft at shoulder and had tusks up to 16 ft .They weighed about 20,000 lbs. Hairy elephant-like creatures who prospered in the Ice Ages. It was a favorite target of Smilodon and we also know cave men ate them .They were the largest elephants that ever lived during very cold times . Item rating and description:1-10 9 Amazing Wooly Mammoth Most of Jaw of a HUGE MAMMOTH with two huge molar teeth. These are the most desirable mammoth items at the most desirable location, the North Sea . This is due to size of the Mammoths there. What is amazing is it’s one piece –never broken. The upward of jaw ends are missing and resto in back of jaws is 4” on one side and 7 “on the other side. This piece is so heavy it weighs probably 100 lbs. Collectors just dream about his but here it is. This is one 30 years old in a private collection. The molars are about 9” x 5” and both completely encased so I’m sure they are pristine root and all. Species description: Extinct Largest Species of Lion ever to exist a full 25% larger10-12 feet and 840Lbs closely resembling the current species in Africa . 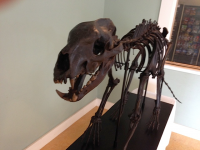 It was the largest carnivore except the Giant short –faced bear which are virtually nonexistent in the fossil records . It was much larger than the Smilodon Saber-tooth cat. There has been 100 specimens in La Brae found but only a handful elsewhere. 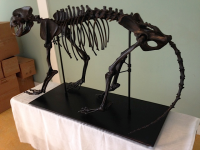 Item rating and description: 1-10 9 WOW Rarer than Smilodon Largest US Pleistocene Predator Ever Giant American Lion 9” Right Jaw with all lower teeth except the Canine is casted. The jaw is 100% original . This is a huge find, and I’m one of only a few to have had even one of these. The other teeth are original and jaw is beautiful . Its from Florida found many years ago. These are so rare. It provides an opportunity for someone to get a American lion at value due to no real canine .This one is so special as it has never had the teeth out of the sockets. It hasn’t been restored at all that I can see as its from an old collection which means it saves you money . 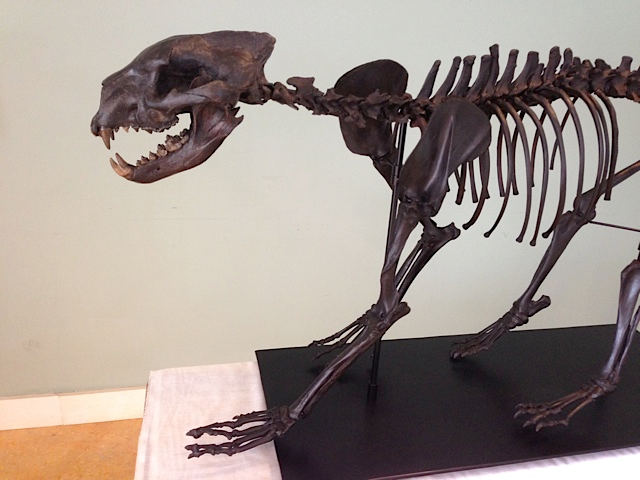 This animal is much rarer than Smilodon which complete skulls if you can find one which I never had go for hundreds of thousands as I have a perfect one above ..It has a metal display also that looks fantastic . These really set it off so you can see both sides . IM just amazed to have such a jaw from the same animal with all teeth intact after maybe 50,000 or more years . This is a great investment. I may be able to get you a f real canine also at some time Ill sell you at cost .Buy missing this front tooth it saves you ½ the price and with a canine at a cost of about 1000 you can have a 6000 jaw for only maximum payout of $3500 . I’d get this while you can as I don’t expect it to last long. This one is worth much more than this but I sell under retail as much as I can. This is a beautiful piece , that is so rare and for this price is simply amazing . I’ve had so few of these in my lifetime.